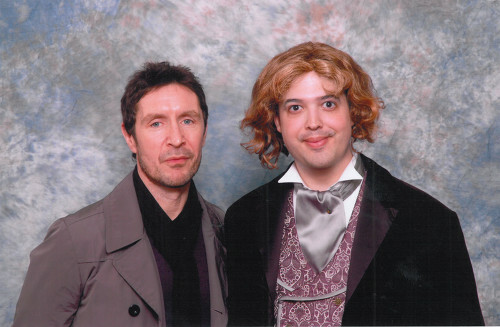 For its sins there has been one good thing to come out of Paul McGann’s gifted costume at the recent Armageddon event in Auckland: it has generated new (albeit brief) interest and discussion surrounding the Eighth Doctor. The timing could scarcely have been better, given that the TV Movie has recently enjoyed a re-release, putting McGann’s also brief and otherwise off-camera incarnation back into the limelight. It’s just unfortunate that the ensemble made for him has proved so uninspiring. This criticism likely won’t go down well with those involved in its creation. Certainly by all accounts McGann seemed very happy with the new leather jacket, sonic screwdriver and satchel made especially for him by WETA Workshop. I say ‘made especially’, but have some real reservations with its design and even its fit. It’s comfortable, allegedly, and gives the Eighth Doctor a NuWho-styled sonic-handling stance, and maybe that’s all that matters. But even with the full costume not yet being showcased, I feel uneasy about this set-up. We’ve been here before, in some way. The most famous early example of a Doctor Who lead wanting his own hand in the Time Lord uniform is Colin Baker, to no surprise given the “deliberately tasteless” brief of his costume. I never minded it, really, and even Big Finish’s expedient blue variation has some appeal. Pertwee and McCoy both had aspects of their audition attire incorporated in their ensembles, but Baker (like McGann) had no input whatsoever and later expressed a desire for a ‘black’ version – even updating his preference more recently to something akin to Ecclestone’s U-Boat jacket or a Matrix-style leather coat. In Baker’s defence it should be added that there was also very little designer control over his costume, the brief coming from (and being revised by) John Nathan-Turner. McGann’s idealised costume on the other hand appears to be the product of inspiration from the actor’s late father (a man who has been a great influence on the actor, as evidenced by McGann’s Q&A session in Wellington this year) and the appearance of the Ninth Doctor’s costume. As such it’s an unfortunate visual coincidence looking at worst like wardrobe-envy, and tempered only by fan association of the still-untouched-and-likely-never-to-be area of the Time War. It’s an easy compromise, but far from a satisfying one because as a rule we like our incarnations to be visually distinct. The fact that McGann also hated his wig and for some time opted for a crew cut might have hampered things more if he had not been grown his hair out recently for another role. Yet, when your ‘official’ look has dated and become a parody of itself, what can you do? In this sense the ‘new costume’ is very much an unfinished piece. Small details offer great opportunities to expand or further personalise wardrrobe – buttons incorporating the Seal of Rassilon (a cliche, but an inescapable motif of the TV Movie), other colours to either provide continuity with the Wild Bill Hickock fancy dress the Eighth Doctor has more often worse, or contrast with the leather jacket to come. The sonic screwdriver? It’s grown on me. Initial blurry photos weren’t promising, looking like a make-do ‘steampunk’ than anything researchd and designed. Persumably it’s supposed to fit in with the ‘Jules Verne’ TARDIS interior, but if this is the case it falls a little ashort with the crystal end and wood panelling. The more recent in focus shot helps define it more, but like the jacket in the way it’s now held (like a torch, end forward) it’s a shout to the new series and its chunkiness is a dead giveaway, Capitulation! As for the satchel – what’s the point of this? Really? There’s an irony that the TV Movie was criticised so greatly for its adherence to the series past in look and feel. It’s natural that fifteen years in public with little change has aged that look. Change is inevitable, change is good – I just hoped for something a little better than this. Who’d have thought we’d come to this? It seems all the planets have aligned for the moment – we’re near enough in Axon heaven for those of us who enjoy a bit of frog-faking bug-eyed curly-whirly in our lives. DWM’s current strip The Golden Ones is storming barns everywhere with a solid team of Johnny Morris and Martin Geraghty leading the charge – and it’s in colour! Precisely the sort of thing colour was invented for, that – the Pertwee canon. Coming soon from Big Finish Productions of course is the spoilerifically-titled The Feast of Axos for Old Sixie and Evelyn, so if you like that sort of thing (and we do) it’s well looking forward to, especially with old Axon Male Bernard Holley soothing the mike with that cake-in-a-velvet-glove voice of his. Oh I’ve come over all funny. What else? Well, Seeds of Doom, innit? There’s an Axon in that one for sure. A green one. Hat-trick! Bouquets to DWM also for their recent interview with mad Tom Baker and his latter-day costume designer June Hudson. In Soho, of course. Six pages of mutual admiration, madness and genuine fondness. It’s a great read. And good to see June’s still dress-model deep in Who, having created the rather painterly cover for the third volume of Tom’s new audio series Demon Quest. And it’s not like she didn’t have designs of her own on Old Sixie and yon Eighth Doctor as well, as this fascinating link shows. A leather jacket, Paul? A big chunky glow-headed sonic that you now have to point at things? A hand bag? Your Doctor’s meant to be approaching an all-encompassing Time War, not a mid-life crisis! Yup. It’s dead. Kaput. Joined the choir invisible. I don’t think draping tea bags over a Cardiff fence is going to bring this one back either, kids. Revisitations Twooo! Carnival! Resurrection! Seeds of Deaaath! Your mileage may vary in your response to that forthcoming DVD line-up. Resurrection gets an episodic treatment and if there are new effects a Tennant-hosted doco and cool Info Text then fair enough and more power to your gunstick. But Carnival? Really? And didn’t we already pay too much for Seeds in the first place? I mean, it’s a good story with some lovely images but it’s a slick package already at two-thirds the price. Sure, Pat’s face is blue on the DVD spine and not full-colour. Apparently this is a BIG DEAL to some of the more OCD collectors out there. 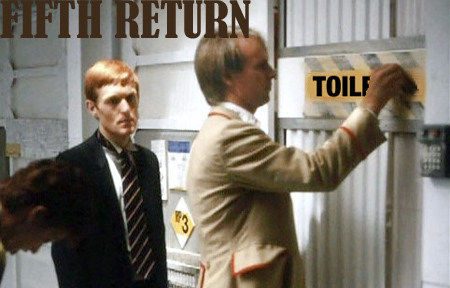 But is it worth delaying a VidFired copy of Tomb of the Cybermen for this? Some love though, people, for our recent additions to the links over to the right. A CosPlay blog that’s really seriously good and well-researched! Doctor Oho is reviewing comic strips (and there’s a great Martin Geraghty interview over on his page too, with some rather tempting Vworp Vworp news!) And even RTP’s blog has shaken some of the grave dirt off and staggered out onto the empty streets, hungry for braiinns!